Many patients, no matter their efforts to maintain their oral health, find themselves suffering from cavities (tooth decay). If you are at a higher risk for tooth decay, Dr. Tyler and his team may suggest dental sealants. A dental sealant is a plastic material (composite resin) applied to the chewing surfaces of the back teeth. The sealant acts as a barrier, protecting enamel by sealing out bacteria, plaque, and food. Our teeth are covered with a sticky film of bacteria, called plaque. When we eat or drink anything that contains sugar, bacteria turn the sugar into acids that can attack tooth enamel. Overtime, these attacks may cause tooth decay (cavities). Tooth decay often begins on the chewing surfaces of back teeth. These surfaces have pits and grooves that trap plaque, bacteria, and bits of food. The pits and grooves are hard to keep clean because toothbrush bristles cannot reach into them. That is how decay starts, in the pits and grooves, and cavities form. To keep decay from starting here, Dr. Tyler may recommend dental sealants. Sealants are easy to apply. It only takes a few minutes to seal each tooth. First, the tooth is cleaned and the chewing surfaces are prepared to help the sealant stick to the tooth. Then the sealant is painted onto the chewing surface where it bonds to the tooth. Finally, special UV light is used to make the sealant harden. Sealants are white in color and cannot be seen when you smile or talk. Sealants usually last several years before they need replacement. Over time, sealants can become loose or worn. Then they may not protect the teeth as well. Chewing on ice or hard foods can also break down sealants. During regular visits, Dr. Tyler will check your sealants and reapply them if needed. Professional dental hygiene visits and regular dental exams will help keep your mouth healthy. Sealants are most often placed on children and teenagers, since tooth decay can start as soon after teeth come in. But, adults can benefit from sealants too, because you never outgrow the risk for developing cavities. 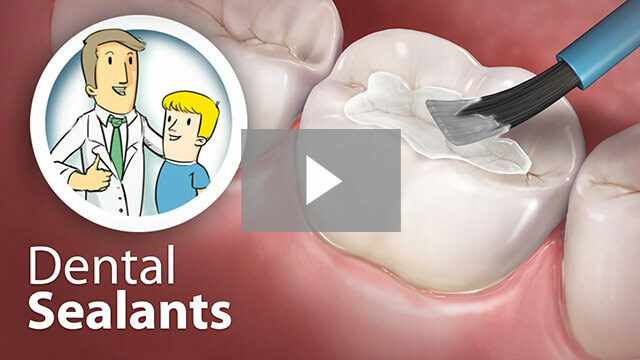 A sealant can only be placed on a tooth that does not have a cavity in its pits and grooves. If a tooth is stained or has mild decay, Dr. Tyler may suggest a preventative resin restoration (PRR). However, if a tooth has more advanced decay, it will need a filling. Dental sealants are non-invasive and preventative in nature. If you find yourself being prone to cavities, no matter how much care you provide to your teeth, then don’t hesitate to ask Dr. Tyler and his team if dental sealants are an option for you.